OK just a little bit about us and where we are coming from. 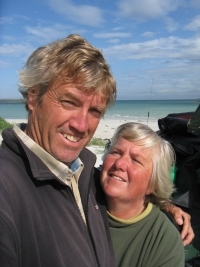 We are Chris and Elayne, UK born Australians who have a love afair with seeing the world and what it has to offer. We have always been travelers and even before this epic voyage we have traveled with our two boys Adam and Tristan. That two year trip consisted of camping around the west cost of America down the Baja back up to the US along the southern states and up the east cost to NY. It didn’t stop there Europe was next and that included the mother country the United Kingdom followed by France, Italy, Greece also the trip back to the UK saw a visit to Switzerland and Germany. This was done when our boys were just 12 and 14 year old and during this trip completed distance education which was tough at the best of times! Now that our boys are all grown up and living there own lives we have decided to spend their inheritance and travel around the world visiting as many countries as possible. Given we, and when i say we I mean Chris, never likes to travel in the conventional way we have decided to build our own vehicle, Victor the buggy! Now please read our blogs, even though some will be extraordinarily long, and hopefully enjoy reading about the trip as much as we have living it and hopefully continue to in the future. 67 Responses to The Crazy Truth about Us! At last a place where we can read up on your wicked adventures. Keep them coming. 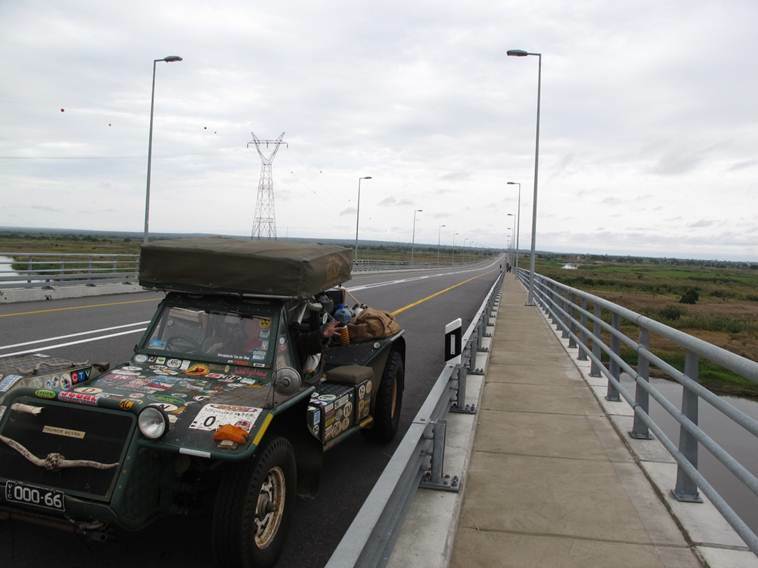 We are about to cross from Macapá into French Guiana in a few days. It’s raining like hell, and nothing shows for a break in the weather. Well, they call it the rainy season for that reason. See you when you get back you crazy pair! Linda and I wanted to say hello, and wish you all the best. I read your last 45 page letter, almost eaten by a Puma…. Lost your camera… I could not beleive what I was reading! I hope you are able to fix the steering knuckel, to bad Greg at German Motor Works didn’t see that, they still talk about you two. We are truly impressed by how you two are doing, give Elayne a bug HUG and KISS for us, we think of you two often. Met you at McKenzies Offroad Store in Anaheim So. Ca. You spent a few nights parked in our driveway, what a pleasure it was. what a pleasure to have met you both even when Dave only told you ( Linda) 3 minutes before we arrived, when you had found a couple of adventures in Mckenzies . THANKS so much for your help accomidation and great pictures of you racing the legendery off road race the Baja 1000 back in the days when things were really tough. Just on this page today for the first time… Well done. You are going so slow now, I am not used to that!!! so well thought out Land Rover. It was such a treat meeting you and chatting outside the shopping centre last week. (I;m the dude from Durban with family in Zambia..!!) Trust that your stay in CT is fruitful and provides the type of rest (??) that travelers so often need from traveling when traveling…(travelers understand..!) Will keep tabs on your journey and possibly meet again when traveling through Durban..!! Helo i met you at Bull eye Kajiado Kenya i liked your mission of traveling for the sake of the child.Kudos. I met you in uganda ,queen elizabeth national park in bush lodge,you have GREAT adeas.Continue you will be asucceful man in the world. Hey guys how you doin as for me i saw you in zimbabwe,c & e i was suprissed when i saw the bug for the first time,guys what you are doin its wonderfull keep it up. It was chatting with you at the Botswana-Zimbabwe border. I am the dude who wants to do an interview with you and your wife. It is good to know that there still some people who have a heart for others and they sacrifice all that they have just to save other people. God bless you guys and enjoy your world travel. You guys are sooooooooo cool!!! Thanks to all of you who have made a comment, and yes we are now heading back to Swaziland as poor old Victor could do with a few repairs, plus the two of us need some rest too before heading off again and doing the west of Africa, hope to catch up with all our new friends in South Africa on the way to the west coast next year. I hope your trip through Africa is going well. Pauline & I had a great time listening to all your stories on the banks of the Olifants. I wish both well, and I suspect that our paths will meet again sometime in the future, in the UK or Oz. thanks for the advice all is going well after 16,000 k’s along the East coast of Africa. Touch wood we are both well just feeling the old age but loving every moment. Really no problems car feeling the African track onslaught as we battle off road across Northern Kenya across Mt Elgon into Northern Uganda. Glad to hear things are still on track. 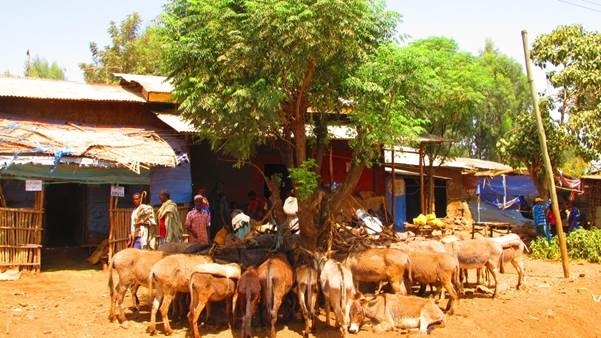 Oh and we stayed on our Demal 200 all the way and were with people who had Malaria, and we traveled all up the west coast of Africa and across the north of Africa and no problems, for us it was good would use it again for sure…. take care hope to see you again one day soon. How did the stay at John’s house end up? How did the dog do? WE are on our way next week to Angola and then up the west coast of Africa we go. Your positive outlook, your generosity and your zest for life are truly inspirational and I can only hope that one day I will be a quarter of the person each of you are! Drive safe and have an excellent journey furthermore! 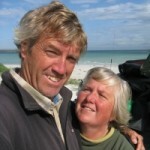 Hi Chris and Elayne, would you mind if we added your website / rss feed to http://overlandsphere.com ? hope all is well with you both, we are now in France, and hope to make our way to Egypt in Oct making tracks home now. Thanks for your wonderful introduction at the Hippocampe in Brazzaville yesterday. I greatly appreciated your stories. Looking forward to receiving you sometime in Lao PDR or elsewhere. Will forward my contact details by email. All the best with your African tour and beyond. It was wonderfrul meeting you at Ivory Lodge Hwangi 24/9/11,and then in shopping centre at Victoria Falls. Phone John F at 774 on return,producer was very interested but would not put through to John. John replied by email later, that he was watching your progress on the internet. Thoroughly enjoyed meeting and hearing your tales, and now sharing your story with our fellow travellers. Happy travelling adventures. encouragement to carry on, now with 108 countries under Victors wheels and about 20 + or – more to do, should see us home by the end of next year ?? I had the good fortune to be in the right place and time, so I could meet such amazing people like you. I too have a spirit of adventure, but it is not enough, we need more money. I admire you. I hope you do not get lost somewhere at the end of World and return home safely, but what next? Greet you warmly, send me a postcard from some interesting places. My address is: Waclaw Gorniak, Snigurskiego 4/6, 37700 Przemysl, Poland. I wish you luck. We stopped for a break on our way to Kiev near the lake and suddenly saw an incredible unique handmade car of Chris and Elayne. And it was like a bonus of the our whole trip. We were so lucky to communicate with you and discover new interesting things. Thank you for your energy and fresh ideas, that are obvious but hidden from our blinkered view of things. You were so open minded and bright that we unwittingly took a small part of your energy and wisdom, that inseparably linked with the nature around us. And i think it is very important point of your trip – to light up people you meet, to plant seeds of organic and peaceful way of life in people’s heads. I’m sure you have passed Ukraine without any problems. Wish you to have your trip further and meet only nice people. Hope you easily managed to reach Australia and to collect money to help the children. I will send some fotos of you to your email. Great meeting you & Victor in Blajan. We are with you in spirit & wish you continued success in overcoming all the obstacles Fate chucks your way. It was great to meet you both and share your enthusiasm about our adventure, thanks so much for your encouragement and kind words. We hope all is well for your future adventures so please keep us up to date. 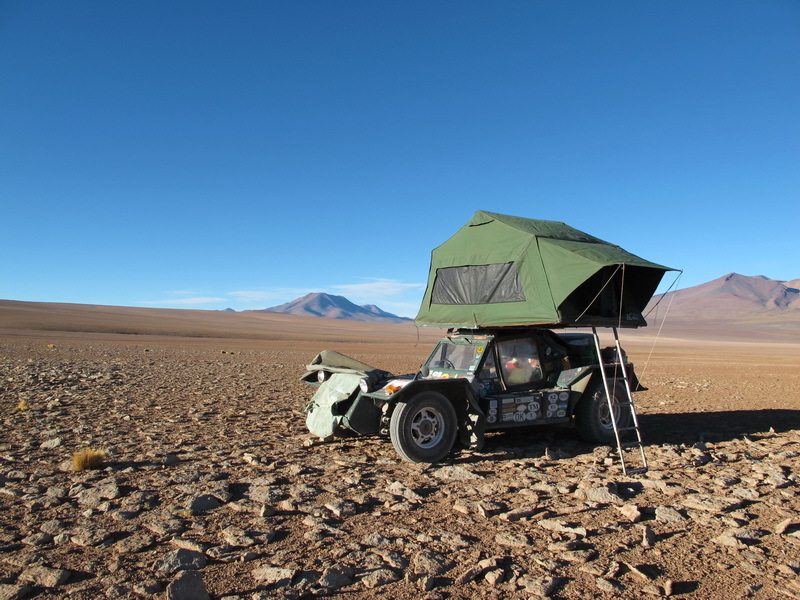 Ps Its always great to meet Land Rover owners from around the world. Finally cleared Tunisian ferry customs with the bikes and had a great time in the desert. We only destroyed one of the four bikes in the dunes so a good trip ! Now home in (Rainy) Manchester England and still finding sand everywhere. Was great chatting to you guys and finding out more about your cool trip. Very inspiring ! Have a great time in Africa with Victor. Nice to meet you at Bruno’s on new years eve, wanted to follow your trip but seems no info on this site, maybe you haven’t set off yet. I met you in Berbera, Somaliland and I had great conversation about your adventure and the challenge of keeping your vehicle going across the globe for six years in the harshest environments. You are absolutely amazing. Hope you have a great time in Berbera and good luck with the rest of your adventure. OMG I can’t believe after years of looking we have found you. You and the boys stayed with us in Cyprus. We lived partway up Troudos mountains. Don’t know if you remember. We tried to contact you through addresses and number you gave us when we got back to UK, but no success. Have always hoped one day we would. Please let us know what the boys are up to now too. Sorry Chris and Elayne I should have said we met in Cyprus in 1996 – 1997. Sooooo looking forward to hearing from you. Please take care. And let us know if you are coming to England. It would be lovely to meet up. Amazing to see you guys are still travelling! I fondly remember back in 2008 at the Hill of Crosses in Lithuania and seeing with surprise Victor with the Dingo camper atop and the Vic number plates! And then getting a lift back to the main road on the running board! Great to read about some of your more recent travels! Hi Chris, Elayne and Victor, I am Aaron Lim that met you at Johor Bahru, Malaysia while you are searching for diesel for Victor. Where is your current location now? Indonesia? Do take care and have a pleasant and safe trip. Looking forward to hear from you soon. How are you guys doing? we are kumar and Marjorie …it is pleasure to met you guys in Singapore, East cost beach car park at night with my frens. Have a safe trip in Asia. Looking forward to hear your new updates. Hi Guys it was great to meet you all too, we are now back home in Melbourne now and trying hard to get used to not having to plan where we are going to head off to each day LOL but its good to be home and to see our sons again and family and friends, remember if you ever come to Melbourne there is always a place here for you to stay……. Hey you three, I just red and understand you are at home. This is almost three years after we met in Sucre. I m so glad you are well. It is a pitty that we will not have any stories to read. Best wiches for the tree off you and hope we once will meet again. Happy New Year.Its so nice to know you reached home finally.Do you remember the group you met at Moreh India . We wish you all the best.How was your trip across Myanmar.What about your fellow travellers? Hi Chris & Elaine,did you get my reply email? It might be in trash. Il avait été un des deux plaisirs de les connaître il y `a plus de 15 ans et plus moi se seul de les remercierai pour votre inspiration. Quand j’ai vue Víctor j’étais un enfant et je me disais dans la tête “hey cette voiture est trop cool” salut à vous les deux Chris & Elayne.